Tottenville Historical Society, 9780615342948, 261pp. Tottenville is located on the southwestern tip of Staten Island and is the southernmost point in New York City and New York State. Far from the urban culture of Manhattan, Tottenville boasts a feeling of independence and isolation. The village of Tottenville came into being around 1840. Its economy and culture arose from oyster fishing, shipbuilding and ship repair, and agriculture. Its trade routes with New Jersey and New York City linked it to the metropolitan region and the greater world. It became the largest town in Westfield, the historic name for this quarter of Staten Island. Even today, although a part of New York City, and encroached upon by modern suburban culture, the feeling of a small coastal town prevails with characteristics unlike any other place on Staten Island. 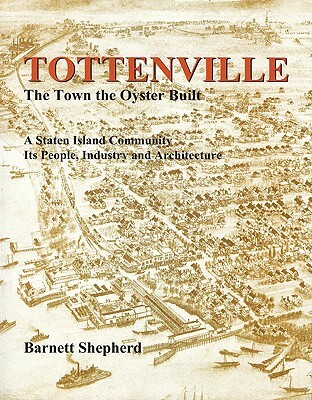 This book documents the activities of the people who created Tottenville and caused it to flourish. Barnett Shepherd has resided on Staten Island since 1972. Before coming to Staten Island he taught art history at the University of Florida in Gainesville. From 1978 to 1981 he was research associate at the Staten Island Institute of Arts and Sciences, where he specialized in Staten Island's historic architecture. He directed a comprehensive survey of historic architecture and presented a major exhibition and publication, Staten Island: An Architectural History. He is the founder and first president of the Preservation League of Staten Island. He was executive director of the Staten Island Historical Society from 1981 to 2000, overseeing four historic properties, the largest being Historic Richmond Town, a 100-acre New York City-owned site with 27 historic structures. He has taught Staten Island history at the Discovery Institute of the College of Staten Island, CUNY, since January 2003. Mr. Shepherd has published scholarly articles and books on Staten Island history.